120 ''Lustrous Leaf'' Kissing Bell Place Card Holder by Kateaspen at Doctor Joe Says. MPN: 12009NA. Hurry! Limited time offer. Offer valid only while supplies last. Couple an autumn icon with a charming wedding tradition to create a spectacular wedding favor for the newly married, especially affectionate couple. Couple an autumn icon with a charming wedding tradition to create a spectacular wedding favor for the newly married, especially affectionate couple. 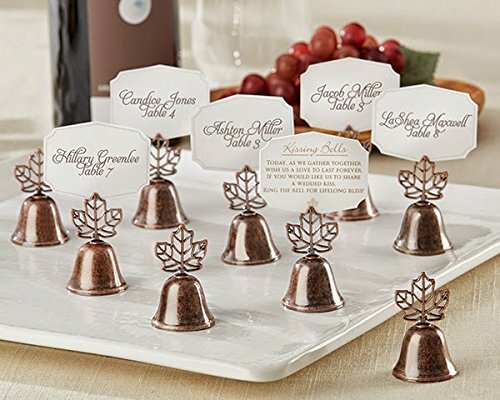 Ring in your new life with leaf-capped kissing bells in a rich bronze finish, so your guests can command a kiss--and you'll be delighted to grant their wishes.